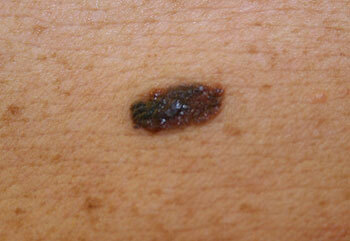 A malignant melanoma is a cancerous skin tumor responsible for a large proportion of skin cancer related deaths. This form of skin cancer sometimes develops from previously existing moles, but can also arise in seemingly ‘normal’ looking skin. There are a variety of forms of malignant melanoma skin cancer which differ in the frequency of their occurrence, however not with regard to their dangerousness. The malignant melanoma begins in certain pigment cells (melanocytes) of the skin. A benign increase in replication of these melanocytes usually appears in the form of harmless moles, however, an uncontrolled malignant mutation replication of melanocytes can destroy the affected tissue structures. The tumor cells can eventually be transported into other regions of the body via the lymph and/or blood system and begin to grow there, where they metastasize (form secondary tumors). Malignant melanomas appear primarily in the later years of life, however in the last few years an increasing amount of younger people have been affected. Fair-skinned people with a high level of sensitivity to light and who don’t tan easily are the most at risk.